Masshole Sports: The Broncos Social Media Is Being Run By A Real Douchebag, Huh? The Broncos Social Media Is Being Run By A Real Douchebag, Huh? 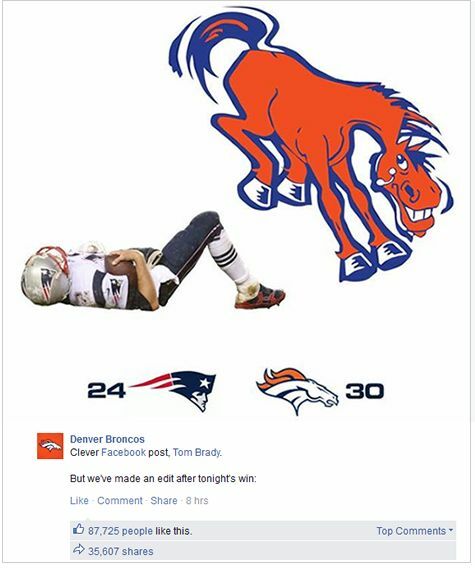 Seriously, Tom Brady's Facebook posts are typically lighthearted and goofy. This is just douchey. In a way though, I'm glad they posted this because it's just going to piss Brady off even more and make it even more likely that the Patriots run the table from here on out.